Untitled (Janet with Cat), 1985/1996, chromogenic print (negative sandwich) retouched with ink, 16 x 11 in. (sheet), 4.25 x 3.25 inches (image), © Estate of Mark Morrisroe [Ringier Collection], Fotomuseum Winterthur. Pat Hearn Reclining, 1982, chromogenic print (negative sandwich) retouched with ink, 14 x 11 in. (sheet), © Estate of Mark Morrisroe [Ringier Collection], Fotomuseum Winterthur. 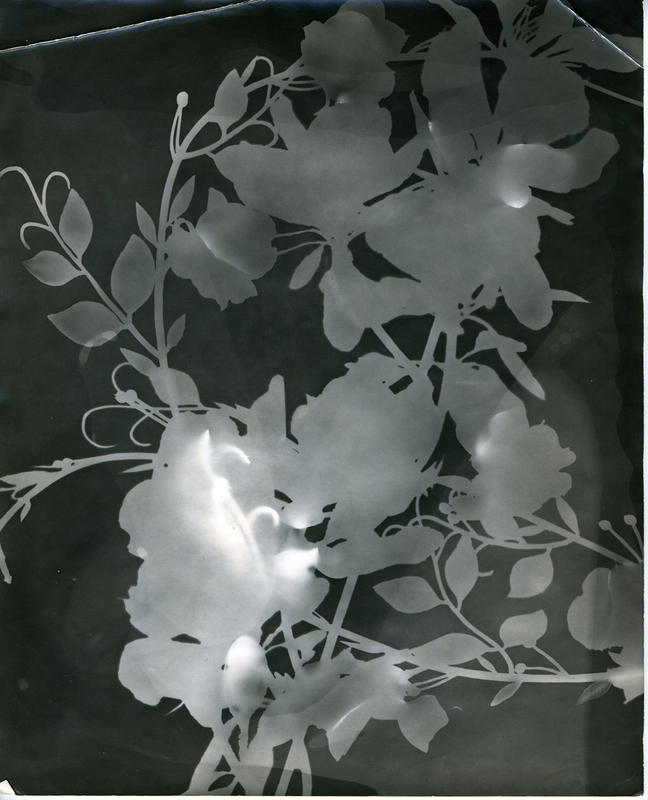 Untitled (Flower Study), c.1986, Photogram, 10 x 8 inches (sheet), © Estate of Mark Morrisroe [Ringier Collection], Fotomuseum Winterthur. I Dream Of Jeanne (Stephen Tashjian's Head), 1983-4, chromogenic print (negative sandwich) retouched with ink, 20 x 16 in. (sheet), © Estate of Mark Morrisroe [Ringier Collection], Fotomuseum Winterthur. The title of the exhibition, Hello from Bertha, refers to a signature image by the artist from 1983-4, which is a “promotional still” for Mark Morrisroe’s Super 8 film of the same name, which itself “was a trashy drag drama based on the eponymous 1946 Tennessee Williams one-act play about a dying, penniless prostitute in a low-class bordello.”[Stuart Comer] Morrisroe stars as Bertha, with Stephen Tashjian (a.k.a. Tabboo!) playing Goldie, and Jack Pierson (née Jonathan Pierson) as Lena. Typical of Morrisroe’s work in all media, “Hello from Bertha” complicates issues of identity often by use of sexual ambiguity. Mark Morrisroe’s life and art are inextricably entwined. The son of a severely depressed alcoholic mother and an absent father, Morrisroe often claimed that he was the son of Albert de Salvo, a.k.a. the Boston Strangler, who was in fact his mother’s landlord and a close neighbor. A restless youth, Morrisroe left home early and began working as a teenage prostitute. At the age of 17, he was shot by a disgruntled john. However, Morrisroe was creative and also unusually ambitious, and despite great obstacles, he amazingly was able to gain admission to the School of the Museum of Fine Arts in Boston. Hello from Bertha is on view at Clamp Art through February 15, 2014.